Good morning and welcome students, parents and colleagues. It is a pleasure to welcome you all for this convocation ceremony. Coming here is a huge decision and investment that will shape the rest of your lives. Many of you travelled hundreds or even thousands of miles to come to Cornell. 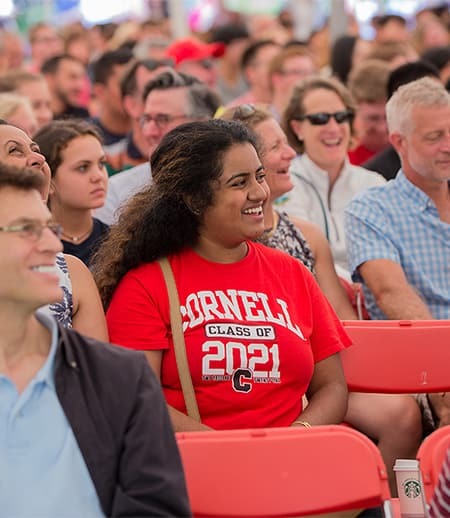 For some of you, your parents have been saving up since the time that you were born to make it possible for you to attend a great school like Cornell. Those of you who are first generation students or international students are leaving behind so much that is familiar to be here. Given the sacrifice and commitment that brought you all here, what motivated your journey? Is it to gain the specific skills and knowledge necessary to be economically successful in life? Is it to learn enough about history, literature, mathematics and philosophy to be an educated person who can participate in informed conversation at the highest levels of society? College may even help you to become citizens of the world and civic leaders at a moment when our nation and our world desperately need your leadership. Perhaps the role of college is a developmental one – for this is the moment in your lives when you are no longer under the direct oversight of your parents, the moment when you can begin to form an independent adult identity, and learn to take responsibility for your own well-being. College may also be the place where we glimpse the future – where we are exposed to the scientific discoveries, artistic innovations, and social trends that will shape our world for decades to come. Yes, yes, and yes. College is all of these things – but it is more as well. Now that’s a provocative statement – that seems to suggest that without a genuine education, we are somehow asleep. Could that be true? Perhaps. Foster Wallace is describing a world inhabited by sleep walkers – one in which your default setting has you living in your own head, painfully unaware of the water or the air or the people around you. Too much of our lives are spent sleep walking. As high achieving students, you are all used to certain routines. As adults, too, we tend to be ruled far too often by clocks, calendars and schedules. All of us can be drowsy at times in how we encounter and process the world around us. In our day to day lives, how many of the conversations we have, the news stories that we read, or the places that we visit feel familiar and expected? How can we really experience the world in 60, 30, or 15 minutes…or in 140 characters? How will we really know the colors of the sky or the unspoken meaning behind a story when we have already moved on to tomorrow, and to the next test, task or tweet. In contrast to this, we hope that what you will experience here over the next four years is an education that will startle you – like plunging into a cold lake, or trying to navigate a setting where you don’t know the language or the cultural rules; or coming up against a poem, math problem, or piece of music that feels impenetrable. We hope that you will experience an education that challenges you. We call it a liberal arts and sciences education because of its ability to liberate the mind – to make the familiar unfamiliar; to open us to new ways of understanding or imagining the world; so that the world ahead is not simply a place you travel through but a place that you discover, or a place that you help to create. And all of this begins here on the Arts Quad. This is the figurative heart of this campus. It is here, on this hill, overlooking Cayuga Lake, where we can imagine the ways that the geography in which we are embedded shapes our identities and our community. The physical environment here constitutes a visible history that can be seen in the rings of these great trees, the layers of rock that line the gorges, or the great Finger Lakes that were carved by glaciers a millennium ago. This is a landscape that takes our measure and gives us strength. It produces strong women and men, and nurtures both entrepreneurs and social justice leaders – like John D Rockefeller and Ezra Cornell; Elizabeth Cady Stanton and Susan B. Anthony; Frederick Douglas and Harriett Tubman. How does location matter for what you will experience at Cornell? It matters for how it challenges you – with the cold, the snow, and the hills that you will climb. It matters for how it inspires and humbles you. It matters for how it connects you. It matters for how it creates a sense of wonder in those who are open to it. You will find wonder, not only in the beautifully diverse landscapes and climate that you will encounter, but also in the people you will meet. Our faculty care deeply about our students and are here to help you succeed. Seek their perspective. Ask questions. Engage with faculty outside the classroom. Ask them about their research. In Arts & Sciences, all of our research is curiosity-based. Our faculty are driven by wonder. You represent the most geographically, economically, and ethnically diverse class in the college’s history. You have traveled from 44 states and 28 countries, and 161 of you are the first in your families to go to college. Since our inception, Cornell has emphasized uncommon diversity with one phrase…any person…any study. Our founders were deliberate in their intentions. Ezra Cornell and Andrew Dickson White, whose statues flank this Arts Quad, formed this university during one of the most trying times in our nation’s history. In the final days of the American Civil War, two weeks after the assassination of President Lincoln, the Governor of New York signed a bill creating Cornell University. Every generation of Cornellians reinterprets and extends this vision of any person…any study. I am a third generation Cornellian, Class of ’83, and I can tell you that we have not always lived up to the ideals of this phrase, but these ideals remain the guideposts for what we do everyday. Because of this vision, you will have access to one of the most diverse educations the world has ever known. Why does this diversity matter to your education? Because the future that you will create must take into account all of humanity, and the issues that will shape our collective destiny. Diversity, in all its forms, is essential for the survival and flourishment of our humanity. Diversity is inherently beneficial for our species. Evolutionary biologists understand this well, so do archaeologists. However, the challenge of diversity is that it inevitably brings about change. Psychologists understand that humans tend to fear change. Historians and anthropologists know how change has led to both the destruction and flourishment of entire civilizations. However, the laws of nature have taught physicists that change is constant and our biologists understand that those who can best adapt to change, are best apt to thrive. Astronomers and microbiologists remind us how a shift in perspective can open entirely new worlds of understanding. Chemists can show us how new materials can be made once we understand the basic properties of these new worlds. Literary theorists and linguists help us understand subtext in our communications to better understand the human condition. Philosophers tackle the very reasons for our existence while artists, musicians and poets express and embody humanity in all its wonderful variety. Your best chance to address the most pressing challenges in our world lies in these varied disciplines, as well as the varied perspectives that every one of you bring to bear through the exploration and understanding of our world and of humanity. Your journey here will be shaped by the opportunities you have to learn from and work with an incredibly distinguished faculty. A couple of years ago, I had the privilege of interviewing one of our most distinguished alums, Supreme Court Justice Ruth Bader Ginsburg. One of the highlights of our conversation was when she talked about taking a modern European Literature class with the great writer Vladimir Nabokov, who was a faculty member here for many years. Ginsburg spoke of Nabokov’s influence on her writing and said that to this day she thinks about what she learned from him every time she writes a legal opinion. Imagine—that 60 years later—one teacher, one class, could have such an impact. Our college has a long history of graduates who come back to campus to teach, guide, and mentor the next generation of Cornellians. That’s exactly what happened for Arts & Sciences graduate Eduardo Peñalver, Class of 1994, who recently returned as the dean of Cornell’s Law School. When Eduardo stepped onto campus his freshman year he was certain about his path—he would be an astronomy major, then go on to medical school. But a freshman writing seminar in history changed his course entirely. He became a College Scholar, focusing on Latin American and U.S. Diplomatic history. He also took part in a protest where 100 students sat in the Provost and President’s offices in Day Hall for an entire weekend. Ten days after the sit-in, he interviewed to become a Rhodes Scholar. He credits the tremendous support he received from faculty and the fellowship office at Cornell for getting that opportunity and winning the Rhodes Scholarship. He went onto Yale Law School and later clerked for Supreme Court Justice John Paul Stevens. Eduardo did manage to take some astronomy while he was an undergrad. Carl Sagan taught an upper level writing class during Eduardo’s junior year. The theme of the course was climate change (this was in the fall of 1992!). About Professor Sagan, Eduardo reflects that he “was a dedicated teacher who spent a lot of time discussing with us his own writing process and helping us to improve our own. That one course, Eduardo says, did more to make him a better writer than any other he had ever taken. Who will inspire you? Who will light your path? What teachers or advisors will help you to figure out who and what you can be? When you walk in to your classes next week, next spring, and over the next four years, which of your teachers will be your Vladimir Nabokov, your Carl Sagan? Can you imagine taking a creative writing or literary translation class with Professor Mort? Perhaps you will find your inspiration in a math class with Steve Strogatz. He thrives on finding math in places where you would least expect it, and then using it to illuminate life’s mysteries, both big and small. He says, “There is a secret universe out there that you can’t see with your eyes. You can only see it if you know math. Mathematicians are the birds, flying overhead, and we can see all of these connections by virtue of our abstract nature.” He finds abstraction to be tremendously powerful because “it takes away all the details and lets you see the essential thing that provides connections and commonality and patterns.” His research into how fireflies flash in unison has been used by researchers in the College of Engineering to create tiny clocks that sync in distributed computing and sensor networks. Have you ever thought of math in this way? Imagine taking a class with Professor Strogatz. Here, you are free to wonder. You are free to challenge assumptions. You are free to imagine new worlds, new ways of being, and take on the most daunting questions of our time. THAT is what sets this college apart. When you settle into your dorm rooms, you will meet students who are singularly focused on their future careers, those who know what excites them and what paths they will pursue. And if you aren’t sure what your path is yet, it could feel like these students are somehow ahead of you in their journey. It is certainly okay to be sure of what you want, but that does not mean that you have it all figured out. In the great tradition of this college, I ask you to challenge their assumptions and your assumptions about what college means and to awaken yourselves to the world and those around you in the process. Help one another to nurture the wonder, imagination and creativity that you all certainly possess. You will be amazed at where that leads you. As you start your journey, I encourage you to think about the stories of past alumni like Eduardo Penalver and Ruth Bader Ginsburg. Envision taking courses from Valzhyna Mort or Steve Strogatz. As you find your path here, I encourage you to be mindful of the great heritage Cornell bequeaths to you, so you may take what you learn to invent a new and better future. Who among you will help to reweave our frayed civic bonds, help us to imagine new ways to address autism, or solve the riddle of what causes Alzheimer’s? Who among you will create the plays, poems, or images that reveal our common stake in forging a future that is less divided by differences of income, religion, race or nationality? Who among you will design new approaches to channel our collective, but unorganized, desire to address climate change and build a green economy that can scale to replace our dependence on fossil fuels? Now, I want to speak to the parents and family members in the audience. With two college aged children myself, I can relate to the flood of emotions that you are likely feeling this weekend -- the excitement, the worry, the bittersweet moments of reflection. Thank you for entrusting your sons and daughters to us today. We promise to guide them, care for them, and provide them with a great education. Students, today, and for the rest of your days, you are Cornellians. This education grants you certain privileges, but it also confers a great responsibility, not only to your family who certainly helped you get here, but more broadly to humanity. Go, change the world, for the better.